Operatives of the Economic and Financial Crimes Commission (EFCC) on Wednesday, 8 February 2017 visited Arik Air’s head office. 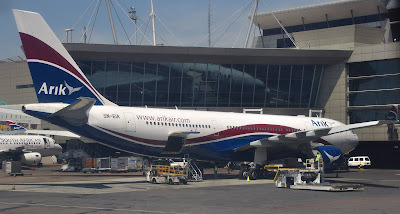 The airline in a statement signed by its Public Relations and Communications Manager, Adebanji Ola, they held a brief meeting with Chairman of Arik Air, Sir Joseph Arumemi-Ikhide after which the Chairman visited their Ikoyi, Lagos office for further discussions and to respond to their enquiries. Having satisfactorily answered the query, the Chairman later left the EFCC office.